Despite its wide distribution in the sporting and general communities there still remains widespread debate on its cause. The condition is often associated with pes planus (flat feet) and lower limb biomechanical anomalies. It is thought that the tensile strain on the fascia causes microtears and chronic inflammation. However, the evidence does not support this. Inflammation is only rarely observed and scientific support for the role of arch mechanics in the development of plantar fasciopathy is equivocal. Current research has shown it is similar to the degenerative process we see in tendon problems. Plantar fasciopathy is common in both the active and sedentary populations. The possible risk factors for these two groups differ. It is more common over the 5th decade of life. High Body Mass index (BMI) A BMI of 25-30 kg/m2 approximately doubles the occurrence of plantar heel pain. Reduced ankle range of motion (dorsiflexion). Reduced or stiff big toe range of motion. 10% of endurance runners will develop heel pain. Pain on the inside of the heel is one of the most common symptoms. Pain tends to be worse on the first steps in the morning after getting out of bed. It can also get more painful after standing still for a long period of time or walking or running . Generally plantar fasciopathy is a self-limiting condition and presents for around 3-9 months but it can go on for up to 18 months to 2 years. The duration may differ if the aggravating factors are unable to be altered, for example, if your job requires you to spend a lot of time on your feet. If you google plantar fasciitis and treatment you will most likely find an exhaustive list of possible treatments. However, there are very few treatments with a strong evidence base behind them, showing their effectiveness. Up until a few years ago the main treatment that was given was to stretch the plantar fascia. However we now recognise that loading the fascia and strengthening the muscles around the foot and ankle may be more effective than stretching alone. The sysmptoms appear to progress through different stages and treatment will vary depending on what stage you are at. 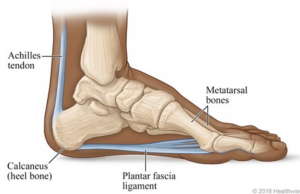 Stage one (pain dominant): During this stage the plantar fascia can be very sensitive and sore causing morning pain and limiting the ability to do everyday activities that require time on your feet. This can last anywhere between one to eight weeks in duration. The treatment in this phase is aimed at reducing your pain by modifying or reducing the aggrivating activities. Passive treatments such as taping to support the foot and massage can also have a short term effect in reducing your pain. Stage two (load dominant): During this stage the symptoms are more stable. Your first step morning pain will have begun to reduce and you are likely to be able to stand and walk further distances with less pain. Treatment aims to increase your capacity to tolerate load in the PF and address other contributing factors. A study by Michael Rathleff done in 2014 demonstrated that subjects with plantar fasciopathy showed a reduction in pain at 3 months following a high load progressive strength training regime. This regime was also significantly better than those who only followed a stretching protocol. If you are keen to improving your heel pain here is a simlifed version of the exercises perfromed in the study. These may not be suitable to start with depending on your symptoms so if you are unsure discuss with your physiotherapist first. If you want to get rid of your heel pain quicker and stop it returning book into see me at Bridge 38 Physiotherapy. Follow this link to book your appointment today. Lets get you pain free and back to doing the things you love.